Join us for interactive Art, Music & Dance! 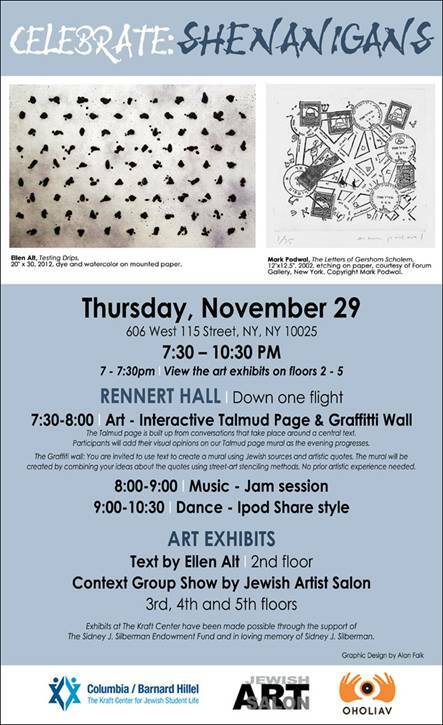 The Jewish Art Salon, Oholiav, and the Columbia / Barnard Kraft Center are excited to present Celebrate Text: Shenanigans. The Talmud page is built up from conversations that take place around a central text. Opinions, interpretations and response can be collected throughout time but shown simultaneously. Participants will add their visual opinions to our Talmud page mural as the evening progresses. No prior artistic experience needed. Write on the wall! Participants use text to create a mural using Jewish sources and artistic quotes. The mural will be made by combining your ideas about the quotes, using street-art stenciling methods. No prior artistic experience needed. Text, by Ellen Alt, 2nd floor. Context, by the Jewish Art Salon & Oholiav, 3rd, 4th and 5th floors. More info on the art exhibits here. #1 Train to 116th Street. Walk South 1 block, take a right on 115th Street.